Forced feedback or found feedback? 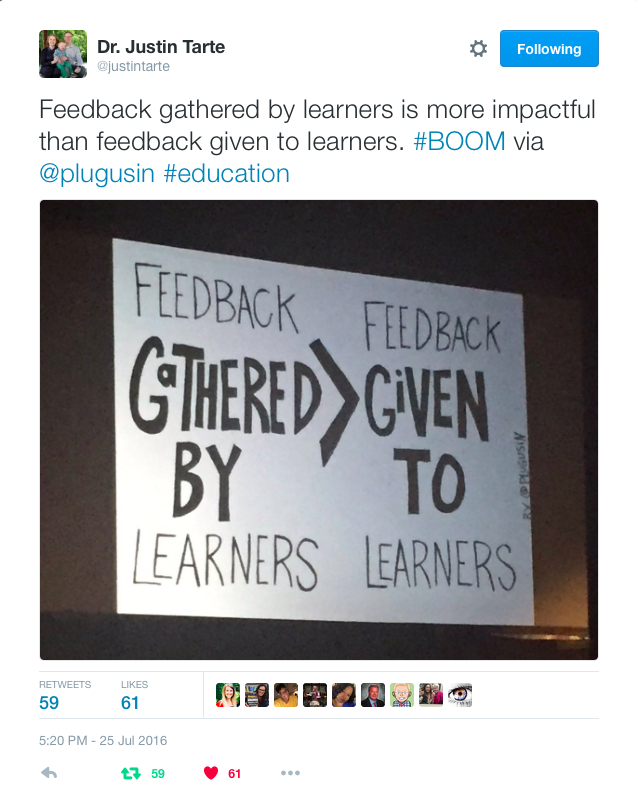 One of the it words of education today and probably something most educators around the world seem to agree about – that feedback impacts learning. But I wonder if our obsession with feedback has us so focused on the potential impact of feedback, that we are forgetting to question the context and conditions of that feedback. Are we forcing our feedback upon students or are we empowering students to own their learning and find feedback in order to help themselves grow and improve? This got me thinking about training I received last year to become an instructional coach for teachers. The biggest takeaway from the course was that instructional coaching needed to be optional in order to be most effective. Teachers needed to seek out a coach by choice because feedback for their teaching was more powerful and impactful when it was something they were looking for on their own accord. Something done by them, not something done to them. So if we acknowledge and protect that for adult-learners, why are we not doing the same for child-learners? Last year I was new to the PYP and inquiry in general. I was excited to transform my classroom into an inquiry wonderland!!! Then one day, I took my first small step towards inquiry. I discovered the power of the question “What do you notice?” and the more I used it, the more I found even more ways to use it! I wanted to teach the short a vowel sound. It was a curriculum expectations and I was still in the mindset that I needed to “cover it”. BUT I wanted to do it in an inquiry-based way – so I took a shot at it. I put a list of words that had the short a vowel sound on a piece of chart paper. Then I asked “What do you notice?” and I was fascinated at the range of responses I collected! So it was a small victory, but I felt energized and empowered to try the same approach in other ways. Obviously I still had a lot to learn about inquiry-based learning but I had found a small opening which helped me begin to slowly unravel the mystery of “but how”? I had felt that for the first time in my teaching career I had guided my students to discovering something on their own instead of just telling them what it was.